Are There Different Bee Control Measures for Different Bee Types? 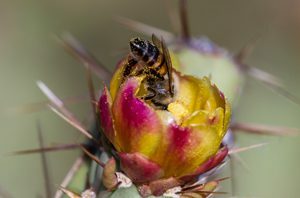 The weather is quickly warming up in the Queen Creek and Gilbert areas so you’re probably seeing more bee activity but the question is, when should I call for bee control or removal and how is it handled? Although we use the same treatments for all types of bee control, the extent of the bee removal will depend on the size of the hive and how long the bees have lived there. To keep you safe and help understand the differences between bee types and the size of infestations, we’ve listed a few common traits of bees below and a reminder of how to respond when bees swarm. European Honey Bees, or EHB for short, were first brought to the United States in the 1600’s by Spanish explorers. These types of bees tend to be more docile so when their hives are disturbed, they generally only send about 10-20 ‘guard bees’ to investigate and defend if necessary and only remain agitated a few hours. They also usually have larger colonies which means they will have larger nests that are above ground in a protected area and this makes the hives easier to locate. In general, if you have these types of bees around your home you may not even know they are there if the hive is well hidden. However, because these types of bees have been in the U.S. for centuries, they are very hybridized, meaning that the gene pool has been mixed with Africanized honey bees. So, any hive you come across will share some traits of the Africanized bee but to varying degrees. This is what makes it so important to call a professional bee control or removal expert if you find a beehive or honeycomb because there is no way to tell the difference between a European bee swarm versus an Africanized bee swarm and you really don’t want to find out on your own if it is an Africanized one. The Africanized Honey Bee (AHB) first came to the U.S. in the 1950’s and although they look exactly the same as European honey bees, they are much more aggressive which is how they earned the nickname, ‘killer bees’. Although their hives are much smaller than EHB hives, they make up for that by sending out 100-200 ‘guards’ if their nest is disturbed and have been known to follow people or pets for up to a mile to sting and protect the hive. It is harder to know if you have an Africanized bee infestation because their colonies are smaller and they make their nests anywhere, including underground. However, if you disturb them, you will definitely know they are Africanized based on how many ‘guard bees’ come after you within seconds. If you notice more bees than usual around your home or yard or come across a swarm, it is important to slowly and quietly move away and monitor it from a distance to determine if you just have a passing swarm that goes away after a couple days or if you may have a hive somewhere on your property. Besides the risk of stinging, especially for younger, older or allergic people there is also a lot of structural damage that can be done by bees’ honeycomb. Luckily, a bee control and removal specialist would be able to complete an inspection to tell you the extent of the bee issue and offer the best solutions. Hopefully you won’t ever get a bee sting, let alone, have a bee hive around your home but they can cause issues. Since it is hard to tell, even for bee experts, if the hive is very aggressive or more docile leave the bee control up to the professionals and feel free to call us anytime if you have any type of bee issue or any pest issue for that matter!